They laughed when I said that I would run the next fund raising event but their faces changed when I gave them £5000 and you can do it too! Let's show you how you can get an income of £5,000 for your group and it is so easy anyone can follow this easy step by step plan. Not only that but your group will have a great evenings entertainment too. A complete simple to follow system that takes you from start to finish covering every aspect of your planning and organising! A ‘Simple 21 Step Plan’ for a fundraising idea – where you can make £5000 for your organisation! I know there are a lot of exaggerated promises and over hyped claims regarding charity money making. But bear with me for a few minutes………. You are about to discover a unique event system that lets you build an income for your group that is child's play to follow and simple to execute. A system that will show you exactly what to do….. step by step….get sponsors... sell horses.....work out the betting and your profits.....get you out of the 'DODO' if it all goes wrong.....how to maximise your group income….giving you everything you need to go from where you are today to your goals. 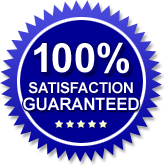 We believe that this ‘simple proven system’ can work for anyone….and we invite you to put our claim to the test……. As you will see in a minute we will be showing you in intimate detail what you need to do to change your non-profit forever! In the end my brother Steve and I ended up with the job of raising funds, eventually we became so good at it we found ourselves as chief fundraisers for the district, for that we used other ideas, but the one I am going to share with you here, is a great starting point for your groups money making. 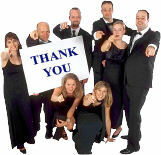 Imagine how it will feel when everyone tells you how great your event was and how much they enjoyed the entertainment. Imagine walking in to the fund raising committee meeting and letting them know that you have managed to raise more funds in one day than they have managed to raise in the last two years.....how would that feel to know that your suggestion is the best in ages......can you imagine the looks on their faces. 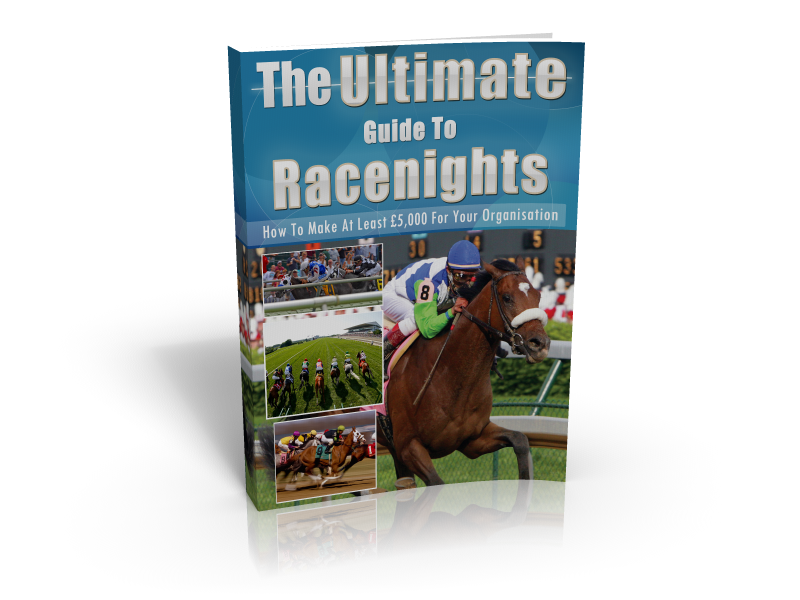 But that is just the start of the gold dust that is contained in these 100+ pages of the most comprehensive guide to running a successful racenight that has been ever been produced. It gives you all that you need to make your event the very best that it can be......there are full instructions on how to start.....how to get sponsorship ......customers to your event.....how to maximise your profits to make sure that your event is the best event that has ever been run! This ultimate guide is your secret weapon to making the most money for your organisation ever!! It will take you from the very start of an idea to the final closing of the event and handing over the cash to the organisation......just think how great it will be to only need one event per year!!!! I know many charities who use their race night as their key fundraiser for the year. That's right they only run one event per year and that raises enough funds each year for their organisation to function for the year......However, like everything in life you get out what you put in...... and like in life everything is easier if you are taught exactly what to do.....if your have a mentor so to speak..... someone to guide you every step of the way...... someone to take you by the hand and lead you through every single step in making your racenight the most successful event that you have ever done. Have you tried both options and which was the most successful.....I am sure that you have had the most success when someone who has done it before has helped you.... well 'The Ultimate Guide To Racenights' is here to be that person who has done it before.....giving you that help and encouragement ......providing you with everything you could possibly need. 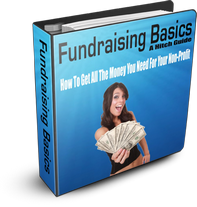 Everything you need to make your fund raising the most successful event that you have ever run. In hindsight I put my efforts into all of the wrong areas...... and no effort into the areas that would generate the most income..... section two of the book will show you how you can ensure that your event is profitable before you even open the doors.......that's right you can make a handsome profit on even before the event is run....make a guaranteed profit in advance. How good would that be....to know that not only are you going to have a fantastic evenings entertainment but you can enjoy that event knowing that everything that you make tonight is in addition to the huge profit that you have made already......the event is just the extras.....I know that you are thinking how can you make a profit before the event. 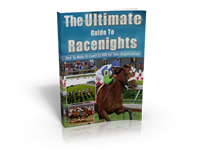 Well that is what I have learnt over the year and that is the experience that you get when you buy this ultimate guide to racenights. Section Two - What Needs Doing Prior To Your Racenight. In this section you will learn all of the hints and tips I have collected during the years to make your event the most profitable and successful that you have ever had. The trick with all charity events is to make sure that you do not lose money!!! This section of the book will make sure that this is the case for your event. No longer will your charity event be a matter of chance......you will have your profits locked in before the event even starts!!! How good would that be... a guaranteed profit before your event....now that's the way to do it!! Included within this section are a host of pre written templates for everything you need to make your money making plan the best that your group has ever had. This section also outlines all of the jobs that need doing to make sure that your racenight runs smoothly. Not only does it give you a list of the jobs but also includes a description of what they need to do. This helps you pick the right person within your team to do that job. As I have said before the key to all fund raising is to make sure that you make a profit before you start.......not to wait till the event day and hope that you cover your costs and make a small profit. The simple 21 step plan will ensure that you do just that. It takes you step by step through the process of organising your best ever charity event. You will be the envy of all of your fund raising committee members..... just imagine for a moment that you come in with a clear plan for your event success.....no need to sit down and think what the heck am I going to do with this.....you walk in and say..... 'Right here is what we are going to do'.....and you have it all printed out all ready and you can let everyone on your team have a copy so that you are 'singing from the same hymn sheet'. No need to make it up as you go but a very clear, 'Tried and Tested Method' that will guarantee your success. The tips on letter writing and the templates I have included within the book are probably worth the price of the book alone. Your first positive reply will probably cover the cost alone and then you are into making a real profit for your group. However, to make this book and even better deal for you I have included some stellar bonuses, but I will get to them in a minute. Let me tell you about the third and final section of the book. Section Three - The Day Of Your Fundraising Idea! Now the big question how much is this going to cost me! Well I have spend quite a few months pulling all of the information together so you don't have too. It includes everything you need to run the most successful event your group has ever had and therefore it's £25.00. How you and you group can get all of the support that they need. Is it your job to set up the latest money maker for your club? The trouble is you are not used to to dealing with money making? 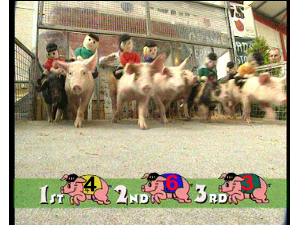 Now everyone want you to bring home the bacon!!! Time is 'a wasting' and you need to get started. What type of event should you be running? Where do you start? Who are you going to call first? And more importantly where do you start!!!!! If you have the right information anyone can run a successful non-profit money making event and I have put everything you need to know into this neat little 'must have' report. Just check out my simple guide and you can be assured that your next event will be a phenomenal success! How To Make Loads Of Money For Your Group! In less than an hour you will be making money just like the professionals. No matter what type of event you choose to do! This simple no nonsense guide will have you coining in the cash! Even if you have never had to raise a bean in your life before now, with my simple....easy to follow guide you will be up there with the best of them! Ask yourself this question? Do you want to make your first event an incredible success? You know the group is relying on you to make this event a great one because the need to money. Do not leave this to chance read the guide and you will be ready to go. You can get your hands on this guide within minutes and start your planning and money making straight away. It usual at the start of any project to not be motivated to get the job done, and that is especially true when you begin something new. There are a few techniques that you can use to not only motivate yourself but also the others in your team to ensure that you all achieve your goals for this project but also in life. At the moment you may not have any goals but once you have these motivational techniques in your 'kit bag' you will be able to lead yourself and your team to success. Once you have mastered these techniques any goal you set yourself will be a breeze! This guide will get you back into the game and firing on all four cylinders to help you get to where you need to be. Everything in these bonuses is here to help in making your fundraising idea the very best it can be........ again this is all geared to helping you generate that £5,000 from your very first event. Look you are my customer. If you are not happy, it's not good for me. Therefore if you are not totally satisfied with what you discover from "The Ultimate Guide To Racenights" I don't want to keep your money. Just drop an e-mail to me and I will gladly refund your money in full (in fact, I'd be embarrassed to keep it). Is that okay? So you just can't lose! Imagine how it will feel taking the money you have raised into to the fundraising committee and it has been all of your work. Your fundraising idea has paid off and the work you have done has made this money. How much of a difference would £5000 make to your group. The advise in this book can do it for you. P.S. Remember, this book reveals in greater detail how you can run an interesting and entertaining event and how to make £5,000 for charity and you can do it too! !